Wagga jockey Nick Heywood enhanced his reputation as one of the best riders in the bush with a day out at Murrumbidgee Turf Club on Monday. Heywood made the meeting his own and rode four of the seven winners on the card. The 22-year-old rode the winners consecutively, claiming four of the first five races on the program. It started with a 6¾ length romp on the $1.45 favourite Secret Copy for Matthew Dale, then was followed by wins on Star Of Serena ($6.00), Mister Marmalade ($3.90) and Nicof ($10). Star Of Serena’s win was for his dad, Wagga trainer Chris Heywood. The young gun took the day in his stride. “I’m happy to go to the races and get one win, let alone four. I take what I’m given,” Heywood said. “I had some good rides and everything went to plan. Heywood had a good book of rides but did not expect the day to turn out like it did. “I normally go to the races with a level head, even if I’ve got good rides, I treat it like normal and with no pressure,” he said. “I ride them as they come. Heywood is based in Wagga but spends little time here now as he covers a lot of NSW riding. 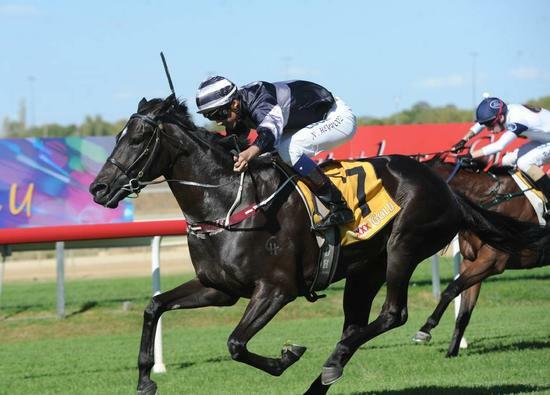 He rode a winner at Muswellbrook on Sunday and regularly rides work at Goulburn and Canberra. Meantime, Superoo ($5.50) returned to the winner’s stall for Wagga trainer Gary Colvin on Monday. Superoo, aided by a top ride from Jon Grisedale, finished powerfully to win the Lambpro Benchmark 61 Handicap (1200m). It was his first run after finishing 14th in the $150,000 Southern District heat of the Country Championship (1400m) at Wagga on March 4. Colvin believes the six-year-old races best fresh, and will try to keep him to trips over 1200 and 1300 metres. It was Superoo’s second win from four starts this preparation. Short ($4.40) made it back-to-back wins for Gundagai trainer David Blundell on Monday at Wagga. Short led all the way to score in the Pah Innovative Construction Class Two Handicap (1400m). Michael Heagney rated the four-year-old to perfection as he kicked strongly in the straight to hold off the fast-finishing Mission Vision ($7.50).